PCFWW are a non-profit group. PCFWW is a group of Derbyshire Fly-fishing Clubs and Coarse Fishing Clubs, who collectively are protecting club fishing waters from illegal wildlife crime for future generations of anglers. Fishing Clubs are the custodians of our reservoirs, rivers, canals and ponds. Fishing Clubs arrange annual Club working party days throughout the year, repairing river banks, improving or creating new fish spawning grounds, and helping to protect the entomology of our river ecosystem and wildlife. PCFWW operate (GVBP) Group Voluntary Bailiff Patrols. Group fishing clubs bailiffs work has a team, patrolling group fishing waters for persons fishing illegally. Fishing Clubs 'Bailiffs,' are patrollling club waters, monitoring for illegal fishing and wildlife crime. The Club Bailiffs would report any illegal fishing activity to the Police and the Environment Agency. Persons caught illegally fishing face prosecution. Fishing Club bailiffs daily patrol for any signs of water pollution which may kill fish or wildlife. Pollution incidents would be immediately reported to the Environment Agency. Should you wish to join a group fishing club, purchase a fishing day ticket, fly-fishing casting instruction or coarse fishing instruction; Please visit our 'find a fishing club'. 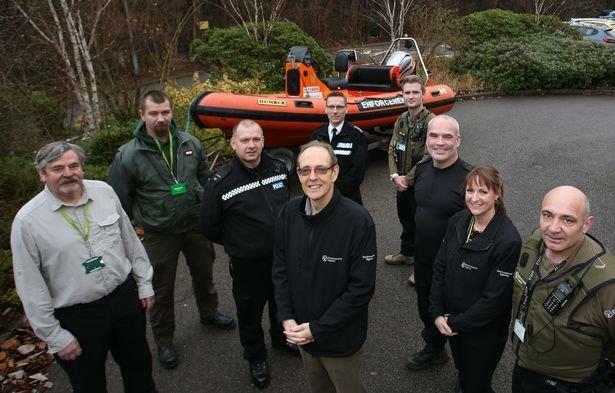 Sir James Bevan, the Environment Agency’s chief executive meets key crime fighting partnerships working with Environment Agency Enforcement Officers. These included, Chief Inspector Andy Rooke, Head of Rural Crime in Nottingham and Chair of the East Midlands Rural Crime Group; Derbyshire Police Wildlife Officers and Protecting Club Fishing Water & Wildlife (PCFWW).